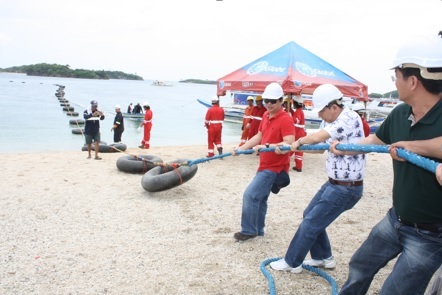 Globe Chief Technical Adviser Robert Tan (in white polo) leads the network team, including project managers from Huawei, in the landing and laying out of the network's fiber optic cable in Boracay. Globe Telecom recently confirmed that it has successfully interconnected Boracay through fiber optics, effectively boosting the connections and strengthening the network coverage of the internationally-renowned island. This was accomplished through the Boracay Submarine Cable System, a two-kilometer fiber optic cable which is able to transmit 80 wavelengths of Dense Wavelength Division Multiplexing or DWDM systems with a capacity of 40 gigabytes per second (GBPS) per wavelength and is expandable to 100 GBPS. This can provide "near to limitless transmission capacity, which will result to crystal-clear voice call and superfast surfing," according to Robert Tan, Chief Technical Adviser of Globe. Along with Tan, other key officials from the company as well as project managers from its partner for the ongoing network modernization Huawei, spearheaded the landing of the submarine cable from Caticlan in the town of Malay, Antique to Boracay. "Definitely, we consider this a major milestone for Globe as we have powered up our cell sites with 3G and HSPA+ connectivity," Tan said, adding that "this submarine cable system will provide Globe a future-proof infrastructure, along with those for the entire archipelago, ready for the next generation communication technology." Globe President and CEO Ernest Cu lauded this development, noting that this further bolsters the progress of the company's network modernization, which has already breached the 60-percent milestone "in record time." "We have finished our optical fiber systems highway to Boracay and this progress is a significant part of building our brand new network. This will bring the level of enjoyment of our subscribers, tourists and vacationers in the area a notch higher," he said, affirming that "this augurs well for one of the major travel destinations not just of the Philippines but of the rest of the world, amplifying tourism economics and activities in the island jewel." Cu said that the building of the Globe network will involve blanketing the whole Philippine geography with the steady progression of the network transformation, which includes far-flung locations, creating seamless coverage for the entire country. The entire infrastructure change-out, according the highest ranking Globe official, is accelerating toward the homestretch earmarked on the first quarter of 2013, "with very encouraging results." "This puts Globe closer in delivering our 2012 capacity plans and network quality improvements to bring superior customer experience they truly deserve," the Globe chief said.